Our brides often ask if we feel hiring a professional hair stylist to do their bridal hair is necessary. We always respond with a resounding YES!! 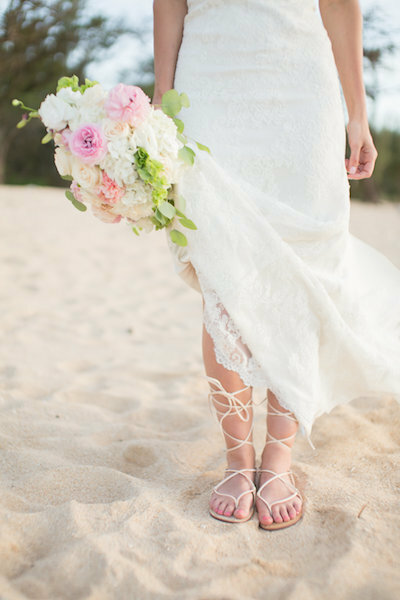 The main reason for this is the islands’ humidity, and wind presents unique challenges most of our brides aren’t used to. The last thing you want on your wedding day is unnecessary hair surprises. Hiring a professional who knows how to expertly style all types of hair for our climate is highly recommended! It can mean the difference between your bridal look lasting 10 minutes or 10 hours. So much goes into making your wedding day everything you dreamed of, from picking out the perfect dress to getting your hair cut and/or colored. This advice Adiel gave is an ideal starting point when planning your hair for your wedding. 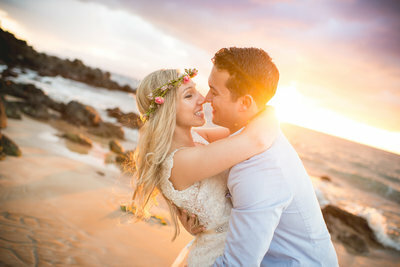 We want everything about your wedding day to work together perfectly; one of the most crucial elements is timing! When asked, “How long a bride should plan for professional hair and make-up?” Adiel responded with. Remember, when scheduling your ‘hair and makeup time’ make sure you leave yourself enough time to get dressed and travel to your ceremony location. Do not forget to leave a little time for the unknown, because someone always forgets something or gets lost, it just happens! The most important thing is to choose a style you will feel comfortable and beautiful with while at the same time is resilient for our climate and weather. Here’s what Adiel had to say about choosing the perfect hairstyle. With “key pieces” of hair pulled back, this bridal hairstyle is simple yet stunning. This “down updo” is the perfect choice to whether the wind of a Maui beach wedding and show off your beautiful long locks! We love the fun braid featured in this half up/half down style. You can’t go wrong with an elegant updo! Not only does it look great, but it also helps keep you cool on your wedding day! Adding a flower crown is a great way to add some fun to a short hairstyle! Plus it’s perfect for a venue or beach wedding! Along with spray tans and facials, hair extensions are one of those beauty procedures some women never consider trying until they’re preparing to walk down the aisle. It’s becoming more and more popular for brides to include some form of faux hair into their wedding hairstyle. The key is choosing extensions that will look natural and complement your chosen bridal hairstyle. 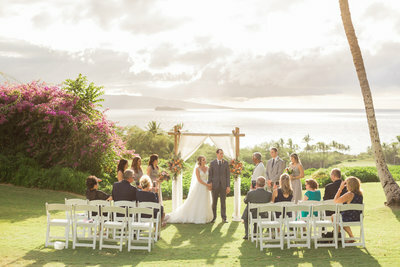 Karma (the owner of Simple Maui Wedding) wore extensions at her Maui Vow Renewal to achieve her desired hairstyle! Using the extensions allowed her to have the past the shoulder style she wanted and gave her hair considerably more volume. The saying “practice makes perfect” could not be truer when it comes to preparing for and taking the stress out of your wedding day hair and makeup! We know with destination weddings, trials can be hard to fit in your itinerary; we often get asked if a trial is necessary for bridal hair. It is important to wear comfortable clothing when doing your wedding hair and makeup prep for a few reasons. How fun is this “wifey” robe, our bride wore while getting ready for her big day?! This getting ready clothing ensures her hair and make-up won’t get ruined from clothing she must to take on and off over her head. This bride chose to have her hair specially styled to the side so it would fall perfectly allowing her to show off the back of her wedding dress! Thank you, Adiel for sharing your knowledge with our brides and us! With these tips, we have no doubt they will be wedding ready when their big day arrives!